Clean, wash and drain broad beans. De-string, tear each to two to three pieces. Take them in a pan add a cup of water and half tea spoon of salt. Boil and keep them aside. (You can either boil them in a pressure cooker for 2 to 3 whistles). Now heat 1 table spoon of oil in a pan. 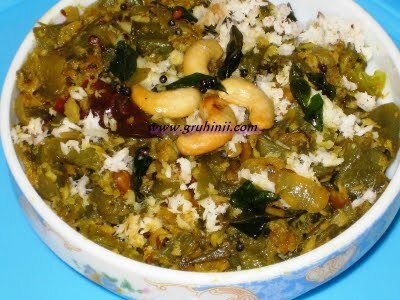 Add rai jeera, chana dal and urad dal. Allow rai to splutter. Stir, when the dals changes to golden color, add red chillies, curry leaves and mashed garlic pods. Fry for few seconds and add chopped onions and green chillies. Fry until the onions become transparent. Add the boiled broad beans, salt and haldi. Fry until the curry becomes dry in a medium flame and add the grated coconut. Mix cook for few more mins. Switch off the flame and take the curry into a serving bowl. 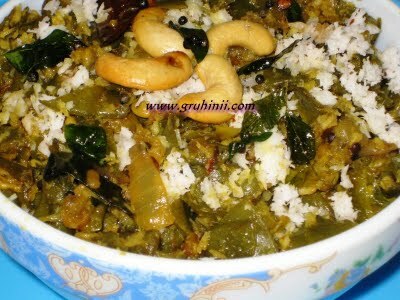 Garnish wth grated coconut and roasted kaju.